The upgraded IT Self Service Portal provides an interactive customer experience. Users can easily open tickets to report problems, search for knowledge articles to help resolve IT issues, and find items in the request catalog. 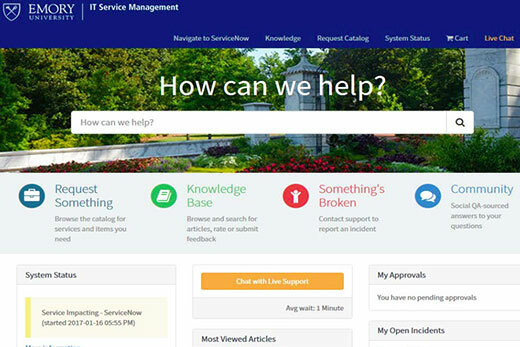 Emory University's IT Self Service Portal (help.emory.edu) was upgraded over the weekend of Feb. 10-12 to improve the experience of those who need IT assistance. The upgrade provides an interactive customer experience for those needing IT information or help from IT support staff. With the IT Self Service Portal, users can easily open tickets to report problems, search for knowledge articles to help quickly resolve IT issues, and find items in the request catalog. Customers will also be able to view their open incidents and request items, as well as see system status details for major IT-related incidents. The project, which began in November 2016, allows Emory to take advantage of a more modern user experience, previously unavailable due to the large-scale customizations of LITS’ original software. The Service Management team (ITSMO), with support from the Emory community, led the upgrade effort to migrate Emory's IT service modules to a more out-of-the-box configuration. This configuration enables the platform to be nimble and take advantage of future enhancements. "The upgrade sets the stage for future releases so we can stay up to date with the latest functionality,” says Sriram Chari, director of LITS Middleware Services. “We believe this change gives us the opportunity to improve our collaboration with the Emory community." ITSMO put the software through rigorous user acceptance testing. According to one tester, Cecelia Pike Bodnar, a business analyst with Emory Development and Alumni Relations, "The updated customer interface is intuitive and user friendly. It includes the prominent display of university-wide system status as well as the ability to easily search the knowledge base and/or engage the University Service Desk using the Live Chat feature." For questions, please contact ITSMO@emory.edu.